Gary Jewelers offering a full line of GrandBands / Grand Bands is a family owned and operated business with over 30 years experience in providing customers with the finest in jewelry fashions. We share and demonstrate values that are held so highly by consumers: trust, honesty, integrity and knowledge. Trust is the fundamental element in our daily business. By actively sharing the customer’s values and beliefs, we have created an environment where people shop with confidence and feel comfortable doing so. Consumers trust Gary Jewelers for accurate information about fair pricing, precious metal content, enhancement and treatment of precious stones and all the other factors that influence their decisions when purchasing a beautiful piece of fine jewelry. 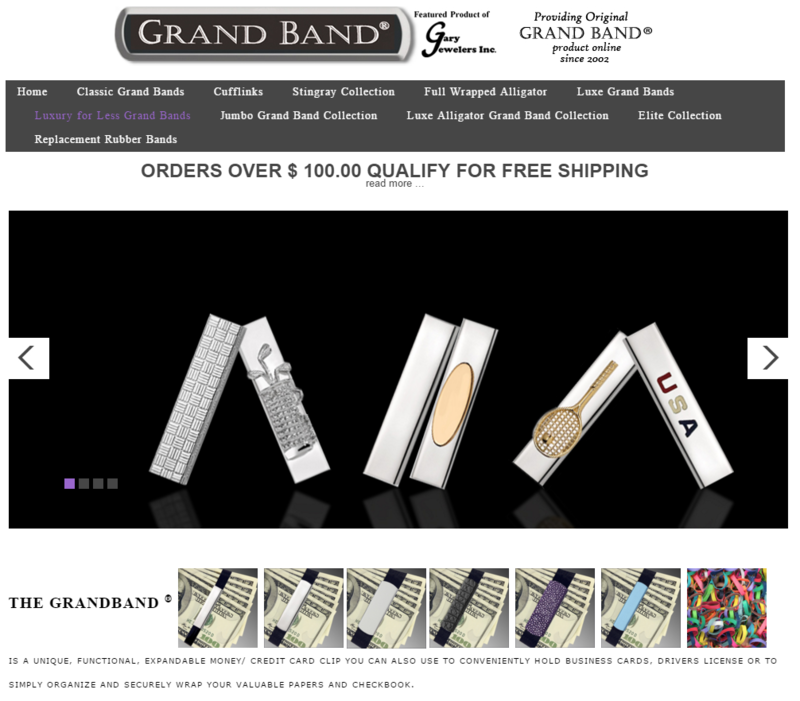 We are the original fully Authorized Retailer of GRAND BAND/ GRANDBAND Since 2002. Now, the experience of dealing with a professional has been expanded to the world of the Internet; so spend some time and click away. It’s been 4 years now since I implemented the change to my brick and mortar business plan. Without any reservations I can say that this “move to an online and by appointment” based concept has been anything but very successful beyond all of my expectations and just as rewarding to my loyal clientele as well. If you have not yet taken the opportunity to do so, I hope that you take the step to call for an appointment to meet with me and take advantage of my expanded inventory and services that are a result of this fantastic change in my business plan. I look forward to meet with you or even to just have a phone conversation to catch up as old friends do. These days, change is all around us. The jewelry industry is no exception. The digital age has altered the way consumers think, how they educate themselves, and more importantly the way they shop. To better meet the needs of our modern day customers, Gary Jewelers Inc. has also changed. We have moved our traditional storefront to a broader and much more spectacular web presence. We have taken our 40 plus years of experience as a fine jewelry business, in the heart of New York City’s Diamond District, and relocated to www.GaryJewelers.com and at the same time also offer our customers an opportunity to meet face to face by scheduling a personal appointment with Gary on 47th street at a time most convenience to you. Call Gary @ 800.829.9427 or email gary@garyjewelers.com to set up your appointment. We are improving the way we conduct our fine jewelry, diamond, and watch business, in order to offer our devoted clients the best possible shopping experience. As always, Gary Jewelers keeps up with all the finest fashion trends and utilizes the newest in technology in order to better serve our respected customers. By growing our presence on the web, we are able to better assist our many longtime and new customers with a vast selection of the newest and finest jewelry available. Our clients in the tri-state area and those that will be visiting will still have the opportunity to schedule a personal appointment to meet with Gary at a new convenient NYC location. We assure you that, Gary will continue to serve all of his customer’s needs with the same professional and caring service that they have grown accustomed to at Gary Jewelers. With the utmost certainty, we guarantee that the excellent customer service that you have grown accustomed to will continue to be the best in the industry. We genuinely believe that you will continue to have a pleasurable and rewarding shopping experience when you shop at www.GaryJewelers.com, or by making a personal appointment to meet with Gary. We welcome your comments and suggestions by phone or email. Please spread our good news by sharing this message with your friends and family!